Nurit Katz earned an MBA from the UCLA Anderson School of Management (named one of its 100 Inspirational Alumni at the school’s 75th anniversary), a master’s degree in public policy from the UCLA Luskin School of Public Affairs (where she is being honored as MPP Alumni of the Year), and a BA in environmental education from Humboldt State University. While a graduate student, Nurit founded the UCLA Sustainable Resource Center. She then served as president of the Graduate Students Association and assisted Dr. Charles Corbett in developing the interdisciplinary graduate certificate program, Leaders in Sustainability, which brings together graduate students from programs as diverse as management, medicine, and urban planning to problem solve and integrate sustainability into their careers. UCLA’s first chief sustainability officer, Nurit also serves on the executive committee of the Luskin Center for Innovation, as well as the boards of the Los Angeles Sustainable Business Council and the Southern CA Green Business Council. The Sustainable LA Grand Challenge in Environment and Sustainability is a groundbreaking interdisciplinary research initiative that brings together more than 100 faculty members from more than 40 departments. Its goal is to move the region to 100 percent renewable energy and local water by 2050. The campus is a living laboratory for sustainability, demonstrating what’s possible for the region and the world. Nurit oversees the intersection between the academic and operations sides of the university, coordinating applied research projects like the pilot of a smart water system developed by UCLA’s Water Technology Research Center at the campus cogeneration plant, or the installation of EV charging stations developed by UCLA’s Smart Grid Center. In 2010, Nurit completed a full Ironman distance triathlon with Team in Training in support of The Leukemia & Lymphoma Society. …authenticity. When we lead from a place that is true to ourselves, we help others feel more comfortable being open and connecting to the work and to each other in ways that are meaningful and productive. This quote from Howard Thurman- “Don’t ask what the world needs. Ask what makes you come alive, and go do it. Because what the world needs is people who have come alive.” The best advice I got in my career was from a friend who told me: You don’t need to figure out what you want to do the rest of your life. Just focus on what you want to do the next two years and make sure it’s a position where you will be learning and growing. Coach John Wooden said, “Don’t mistake activity for achievement”. As I grow in my career I am learning to prioritize and learning when to say, “No.” This would have been helpful earlier in my career, since I have a tendency to enthusiastically say “yes” to everything and can end up with too many projects to juggle. …set aside designated time for it. 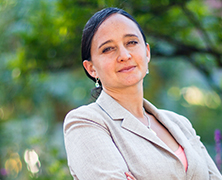 … from graduate school to head of sustainability for UCLA. I learned that I needed to find a sustainable pace- the work is infinite, and I’m not. The pace that I kept during graduate school was not one I could maintain for years to come. …gratifying. This field is very collaborative, both the men and women are open to sharing best practices and connecting because we are working towards something larger. The facilities side of my work is traditionally a field with more men, but as the older sister of three younger brothers I never felt uncomfortable in those settings. …critical. If you aren’t failing, you aren’t pushing your boundaries hard enough. …taking time to be outdoors and trying to make sure I turn off my electronics when I’m with family or out hiking. It’s hard to unplug in our culture today, but important. …I found that I was volunteering most of my free time doing similar work because I loved It. I am grateful to have found work I am passionate about. If I won the lottery tomorrow, I wouldn’t leave my job.